Another year comes round again, a sluggish beast moving at the same speed for time millennium, a forgotten remembrance graspable when concentrated upon. “Here! I think I’ve got it!” The witless author takes hold of the reins. This secret so immaterial a great wall could be built in the blink of an eye, in the decades, the centuries compounding, shrunk into seconds, ticking away. Life. The 29 chapters passed into shadow, wine splashing from broken stemware, thorn-rose spots blossoming, red into white, white into darkness. Here is the 30th section, following right where the characters travelled from the earlier chapter. Remember? The players are caught in a December Solstice downpour as they journey up Mt. Erie to play on blood-soaked grounds; these men and women shaken from their normal pre-holiday lives by forces unwelcome to their island home were called there by unknown compulsions. Where is the light? Where is that counterforce? If you’ve read the entire piece up to this point, light, and a power to combat this growing evil on the island, has not yet made an appearance . . . that is still to come. If you’ve read my companion story, The Volunteer, which takes place in the same timeline, but a few months further ahead in February, you’ll be happy to learn that the two tales are connected, that more than one being from the darker side of this great mystery has travelled to Fidalgo Island, and that the major players will meet as time again rushes forward. In fiction, this rushing of time may happen in a split second. First, read this chapter below . . . The secretive private audition will begin shortly, and no one will remain the same . . . thank you for having faith in this horror tale, and for encouraging more and more writing in the new year ahead. Enjoy, and please comment after the last send-off below. I cherish every opinion. 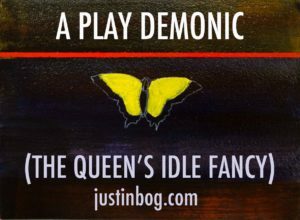 If you wish to read A Play Demonic (The Queen’s Idle Fancy) from the very beginning, simply click HERE for Part 1, and if you’d like to just refresh your memory and read the last chapter, simply click HERE to begin reading Part 29 . . . it has been too long. Above the clearing, to the left of the overhang, sheer stone, an island rock kept tight counsel with the pines and crumbled with age. Occasional lightning bolts sent shards, boulders sparkling into rivets, avalanching down to the forest floor. Behind one of these boulders, with a protected view of the natural stage below, a shadow moved into place and froze. This shadow blended with the dark night. It was called there. It didn’t know who did this calling, and in the sludge of thoughts settling in its mind, this became troublesome. To the north, on the mainland closer to Bellingham, rock slides stopped I-5 highway traffic for hours, sometimes weeks, if the debris grew too cumbersome to blast, load up by truck, and discard. Not too often though, detours diverted traffic around lakes, other mountain passes, and life continued as normally as possible. When the weakening bridge fell years ago too close to the island, citizens grumbled but pulled together. The five month delay became a story to tell weary children learning how to drive, another tall tale to instill fear, cautiousness behind the wheel. Remember when the bridge collapsed into the Skagit River? That was something. No one was hurt even though three cars fell into the drink. Fear of heights, bridges, weakening infrastructure, grew, and therapists collected this data with wearying frowns, something else to medicate against. Fear. This shadow above the rocky theater, what would become an audition stage soon enough, flickered in the darkness, a small yellow-winged thing drawn forth, unnatural in the December chill, approaching freezing, the raindrops a strange weapon to something so delicate in appearance. 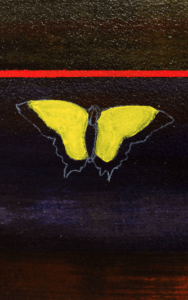 The butterfly rested beneath another rocky outcropping, as if two stone rooftops formed there long ago for just such eavesdropping. Dry powdery ache. What sent this cousin? The first butterfly made another appearance, freed from the box at the Belloon home four weeks past during the Thanksgiving celebration. It chose. Unknown is if this choice, like any other, would bear fruit or remain the most arbitrary of evils. A second yellow butterfly to match the first, or, as its tiny brain developed, charted a different path to safety (it knew). Somehow it realized the first traveled off the island when it still could, before the hex took place, before the counterforce approached, something that always happened, as perfect as a German train clock. For every action there is a separate response, an unwelcome action in the glen. The play had its players, and these moments, like bones scattered by a witch’s palm for divination, brought change if what was learned held. Forgetfulness also joined the stage dwellers. Frederick Waltzcrop waited there with Leonora to his right. He rested his hands on top of his silver-tipped cane. The clothes he wore, including his top hat, stayed dry. Leonora trembled in the chill. She’d dressed in black following whispered instructions. She listened. Her frizzy hair could be pulled back for the challenge ahead. She wore no makeup. When Kate arrived, followed by Martin Belloon, Leonora’s features twitched, her upper lip rising in feral response. Kate returned her own feral response, fingers tightening into fists, one sharp nail puncturing through skin, forming a crescent of blood hidden in her palm. Camoustra whispered in Kate’s ear, stroked her index finger across Kate’s right arm as if steadying a back-arching cat. Frenalto whispered his own poisonous bon mots into Leonora’s ear. All eyes were on them. Martin Belloon’s entire being beamed with pride. He wished Carole could witness his triumph, as he always wished she were there to record his achievements. The subject distracted his narcissism in minute increments . . . glad-handing, schmoozing, rubbing elbows with the moneyed Anacortes charity-giving board members made him stiffen with exquisite pleasure, at times, and he’d take Carole to bed afterwards, teach her to appreciate his efforts more and more. In recent days (his memory slipping through the fog in his brain) he’d been utterly sadistic with Carole and a frown creased, an instant reflection, across his face. 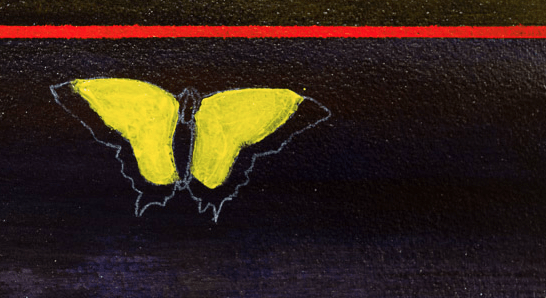 An echo deep within murmured: What am I doing here? Who are these people? They disappear and materialize right in front of me. And then: The play. Oh yes, I serve at The Queen’s pleasure. “Yes. I’m looking forward to this, Mr. Waltzcrop!” Oh yes! Belloon handed Kate a few pages copied from the play. The audition would take place sheltered from the rain by the rock outcropping, keep the play dry. Kate glanced at the first line of dialogue and handed the pages back to Belloon. Leonora stepped close enough to strike Kate across her face with full melodramatic force, theatrical hubris. Frenalto touched her shoulder and she wilted back to her place closer to the edge of the clearing. The sky darkened, if that’s at all possible in the blackness. Some said this year’s solstice coincided with the darkest day of the year, possibly the darkest in over five hundred years, a lunar eclipse helping to blacken the night around them. Waltzcrop chuckled, but so low no one else heard him. “I won’t need the pages either. Just tell me the scene. I memorized Queen Stormag’s lines the first time I read it. They’ve stayed in my head.” Leonora wanted to add the word somehow . . . since this had never happened to her with any of the plays she’d taken a role in. As she aged, grew into maternal roles, drunken wives, a wise-cracking Magnolia, Lady Macbeth characters, the ones she could chew the scenery to bits with, memorizing had lessened considerably. She’d never confess to such a weakness though, and she’d be damned if she’d confess it to Kate, her majesty, no matter how sarcastic she could make her delivery. “Terrific! Ready whenever you are, Kate.” Waltzcrop moved a step back, relinquishing the small stage area, drawing Martin Belloon with him. They watched as Kate dropped her head to stare at her shoes, the pebble-strewn ground, rock, the hardness and the height, where eagles built nests in the trees and taught their young to fly above the Sound. Where she was, how terrible a place, never entered her mind. The play had taken her long ago, and she concentrated her energy there. She was The Queen. Stormag. Her Magnificence. Frenalto bowed to his queen. The light of three lanterns placed behind the players was sufficient to see every emotion on their faces . . . Kate began. “We are all demonic!” Queen Stormag (Kate now) said this to her handmaidens, triplets, born on a distant Beltane evening to a farmer whose sheep grazed royal pastures for generations. Their mother died minutes after delivering her third daughter, never conscious enough to see how tiny they were, how red, like the gums of her grandmother after eating strawberries, sharing them with her, laughing on her wedding day, a string of wildflowers a woven crown atop her doomed head—her grandmother helping with the birth and cursing moments later. Two boys under the age of six and now three girls to feed with warmed goat’s milk, an unnatural beginning. The Queen caught sight of them only four years later and took possession of them by royal decree, paying for them like the best cattle. The grandmother forevermore mumbling something about garbage, insolence, and hardship, and annoying what few relations remained. She had to tow the line. She was her son-in-law’s property just the same, and he was the only one she allowed to order her about. She wouldn’t miss her granddaughters one second. She became the replacement mother in the house, still young for her age, and gave birth to a son not too long after that, making her son-in-law prouder and prouder. Hiding sins with ease. “Yes,” Frenalto said, playing the part of one of the three Aguivera handmaidens, all three in this scene surrounded their queen in the far tower of the castle keep. They helped her dress in finery. They studied the dark subjects in the books she provided. They loved her. “All of you as well. Purity. Use that above all.” Kate felt the power enter her as she spoke this line. Waltzcrop watched with growing satisfaction. Belloon was trapped by a mesmerizing ecstacy so enrapturing he couldn’t take his eyes off his queen . . . yes, Kate is Queen Stormag, she’s the one. Leonora’s weakness was her fear, worn so obviously. He glanced at poor poor Leonora as the performance shriveled her last sense of self worth. Frenalto’s delivery for each of the three Aguivera handmaidens differed one from the other, distinct in the dank chamber, recalling each of their delicate vibratos with perfect mimicry. The light of the lanterns wavered. “Take her now. There’s a traitor amongst us. Serpentine boldness. I’ve watched her every action, aware of her betrayal from the beginning of time.” Kate pointed at Leonora as the power of the play rushed through her. In a different time, an age of dragons, Queen Stormag pointed to a tapestry, the image of a knight in armor riding a white stallion centered on forest green, a hidden door behind it, and the Aguivera handmaidens, with righteous glee, ripped the tapestry to the castle floor. There, shaking now, the blacksmith’s daughter turned, tried to flee. They caught her and Queen Stormag pointed to the high tower window. “Throw her out, my handmaidens. Tell the knight watchmen to cut off her head and place it on the hungriest spike bordering the drawbridge. Then. Bring me The Blacksmith.” Defenestration, a fearsome and heartless command, made Queen Stormag (Kate!) shiver with calming joy. Frenalto turned towards Leonora, who backed up a step, closer to the cliff’s edge, where Petey Pete Pete’s headless body had fallen not too long ago. 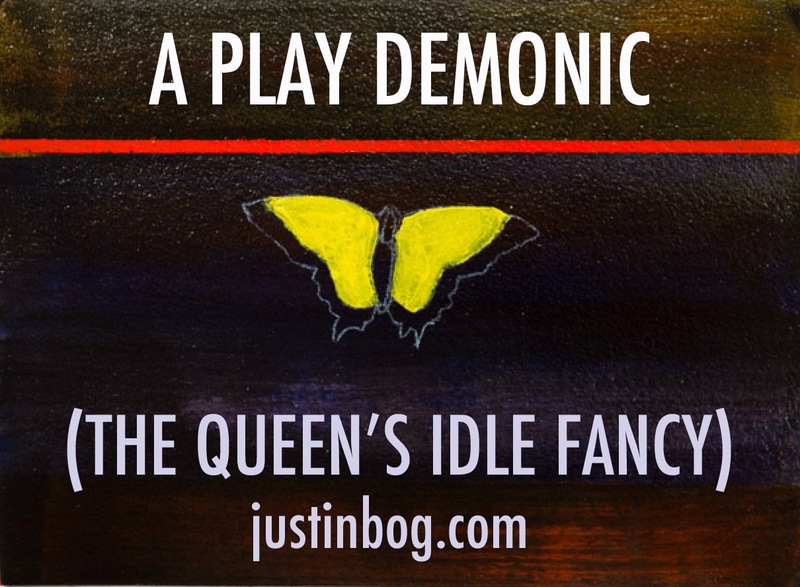 To read the next chapter of A Play Demonic (The Queen’s Idle Fancy), please click HERE to find Part 31! Thank you for continuing on this journey with me. The writing will gather steam in the new year with two stories and more than a few novellas reaching an end point. I feel grateful at the end of 2017. 2016 shared a lot of surprising doom, death, and a contentious election season. Does the future look bright? I hope so. I wish you all a Happy New Year. Take care of your family and give to others without any expectations of kindness returned. If you’d like to begin reading my second horror tale, linked to A Play Demonic by setting and characters, The Volunteer, please click HERE to begin reading Part One!